Need ideas for a romantic celebration with your loved ones this Valentine’s day? Valentine’s celebrations do not always have to be luxurious. Sometimes, all you need is a good company and the perfect place to celebrate the occasion. Look no further! Just like all apartments in Temecula, your apartment can be your very own special date place. You just have to learn to tweak and organize things a bit to set the mood and keep the love flowing. Here are DIY apartment decoration ideas to help you plan for a romantic date with your valentine! Whether you are celebrating Valentine’s day with your family or significant other, a garland of your photos will surely create a romantic vibe in your apartment. Dig up every photo album and gallery that you have, and pick the most romantic pictures that will remind you of the special and memorable occasions you have shared with your loved ones. Nothing beats the classics. 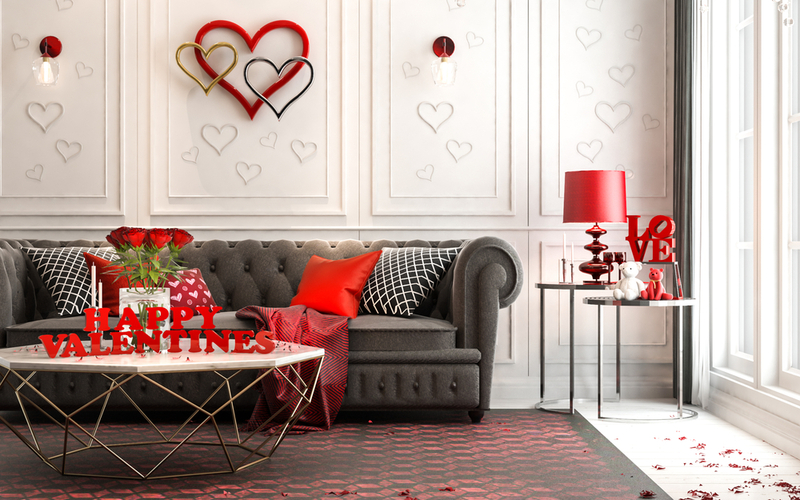 Get your creative self-ready, and make sure to decorate the room with a garland of hearts. You can mix pink and red hearts to form a romantic vibe. Pair it with candles and flowers on the floor for a perfect match! Spice up your place with the spirit of LOVE! Add an accent to your walls by posting black and white photos of you and your loved ones. Add colors to it by filling up spaces with red paper hearts or hanging a string of hearts in the middle of the photos. Candles create a romantic vibe that warms the heart and fills people with good old memories. Run to the nearest store, and buy scented candles to light up your room, and surprise your loved ones! Make sure that you keep them in a safe place to avoid accidents. If you are celebrating with your kids, artificial candles are the best options. Ornaments are one of the best decorations that you should never forget when planning your Valentine’s celebration. Fill up a vase or two with your preferred flowers, and add a splash of color to your apartment. You may also spread petals on your floor, on the couch, on the bed or table tops. Of course, there is no greater way to celebrate Valentine’s day than with your pets. Make it a memorable celebration for you and your best buds by filling the room with sweets for you and treats for your pets. Redecorate your old jars, and fill them up with foods that you can snack on while watching a romantic movie. You may also tie a string around the jars with photos of you and your pets. Every day can be Valentine’s celebration. You just have to tweak things in your apartment and let the romantic vibes flow. Throughout the years, Sycamore Terrace Apartments in Temecula has been a witness to the strong bond of couples and families. It offers three spacious floor plans perfect for residents of any sizes. With the large floor plans that we offer, you can redecorate and celebrate in every corner no matter the occasion. We can ensure you that you and your loved ones will undoubtedly have a wonderful celebration not just this Valentine’s day, but throughout the year! Candy Hearts for the Early Birds! Stop by Sycamore’s leasing office when you pay rent to pick up a sweet Valentines’ Day treat. Treats are for adult residents only, and first come, first served while supplies last. So, what are you waiting for? Pay your rent now, and enjoy an early Valentine’s treat from the Sycamore Terrace Apartments in Temecula family!